Fraser’s comprehensive history shows how partisanship and compromise have always been ingredients in the stew of American politics. This meticulously researched volume follows the evolution of the United States from 13 disparate, self-interested Colonies to one nation united by the Constitution. Writer Fraser allows that this is well-traveled ground but explains his goal in his introduction: “I want to provide a historical account for the general reader, one that answers a basic question: why are we one nation, and not two, or four, or fifty?” He answers that question with anecdotes and a straightforward, easy-to-follow historical primer. Take, for example, this passage about the dilemma faced by the founders when designing a national government: “Madison was grappling with the age-old problem in democratic governments of whether elected officials should act purely as delegates who simply follow the wishes of their constituents, or whether, as Madison preferred, they should exercise independent judgment.” The founders also struggled with citizens opposed to national rule: “The ever-present suspicion of centralized power was a great disincentive to forming any type of national government, and it would continue to bedevil the leaders of the American Revolution over the ensuing decade.” After a decade with the ineffective Articles of Confederation (1781-1789), under which the states held most of the power and the national government little, came the development of the Constitution, completed by a Bill of Rights, the framework that the fledgling nation required. Fraser also explores the many British missteps in policy that led the previously loyal colonists to pick up arms against their former homeland. The author shows a knack for choosing the best material to reinforce his points, whether he’s writing about the foibles of historical figures or the political infighting at the Constitutional Convention (all men are created equal, but don’t anyone talk about the slaves). Fraser has created a well-structured work that both informs and entertains by putting human faces on those parties involved. He illustrates that the nation’s early turmoil still echoes today, as the tug of war between personal liberty and the public good continues unabated centuries later. 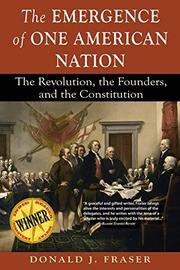 A thorough, successful re-examination of the many competing factors that went into the founding of the United States.